Concrete Densifiers help seal masonry, concrete, and other Portland cement based materials into a mass that is solid, rather than porous. Its penetrating quality provides deep sealing that is effective for the life of the concrete. This creates a floor surface that will be easy to clean and maintain. Concrete densifier’s chemical densifying action hardens and strengthens within the concrete mass, protecting against deterioration. This densifying action produces a floor that is resistant to traffic. Rather than eroding, the floor surface actually self polishes. What is a Densifier and Why is it Important? With the development of polished concrete there have been a number of new products introduced to assist contractors with the polishing process. 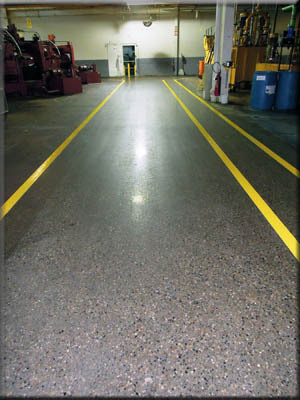 The most significant development in concrete polishing has been the introduction of concrete densifiers. 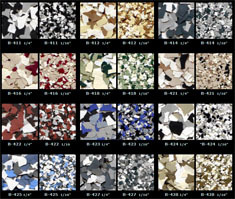 There are a large number of concrete densifiers available on the market today. There are three different types of densifiers on the market with regard to the chemical composition; Sodium silicate, lithium silicate, and potassium silicate are the different compounds available. The densifier is applied to the floor to create a denser surface structure and increase the longevity of the polish on the floor. The primary way in which they do this is by increasing the abrasion resistance of the floor making the surface less susceptible to scratching, scuffing, and dusting. Dusting is the process of the concrete surface deteriorating and creating fine dust particles on the surface as it wears. This is the most common and most detrimental issue with polished concrete in that it wears the polished surface away and exposes the unpolished surface below. 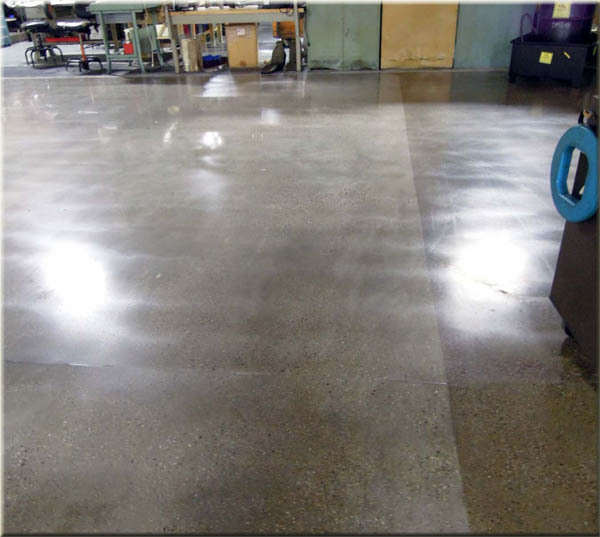 The primary purpose for applying a densifier to a polished concrete surface is to prevent this from occurring. So How Do Densifiers Work? All densifiers work in the same way in terms of the chemical reaction that occurs and the final composition of the surface. You will notice that all densifiers are a type of silicate compound. This is because the silicate is what actually changes the surface characteristics of the concrete, the sodium, lithium, and potassium just acts as a transport agent for the silicate. The densifier reacts with the free calcium carbonate in the concrete to create a crystalline structure in the surface pores of the concrete referred to as calcium silicate. The calcium silicate structure in the pores of the concrete is what increases the strength of the surface. The byproduct of this reaction, depending on which type of densifier you use, is sodium carbonate, lithium carbonate, or potassium carbonate, none of which have any impact on the surface characteristics of the concrete. With sodium silicates you apply them by flooding the surface with the densifier at a rate of approx. 200 sq. ft./gallon and agitating the product with a broom or low speed scrubbing machine. You then wait, allowing the densifier to completely react with the surface of the concrete, and then thoroughly rinse the surface to get the excess product off. Rinsing is important because leaving the excess sodium carbonate on the surface can lead to ASR (Alkali Silicate Reaction) which can have a negative impact on the concrete. If applied and rinsed properly this is not a concern. Lithium and potassium silicates are applied in a different fashion. They are sprayed on the surface at a rate of approx. 500 sq. ft./gallon using a low pressure sprayer and are left on the surface with no rinsing required. These products are generally quite a bit more expensive on a per gallon basis, but when applied at the rates suggested by manufacturers they tend to be comparable in price with the sodium silicates on a price per square foot basis. Lithium and potassium densifiers are substantially easier to apply and it’s no surprise that most polishing contractors push these types over the sodium silicates. There is no rinsing or surface agitation required and therefore it creates far less work for the polishing contractor. Lithium and potassium densifiers advertise having increased penetration over the sodium silicates and claim to have a more evenly distributed surface densification. 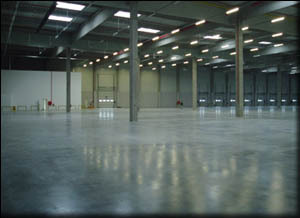 Some lithium and potassium densifiers only increase abrasion resistance of a concrete floor by 20-80% depending on the manufacturer. The penetration of the densifier is irrelevant to some extent as the polished surface you are attempting to maintain is less than 1/64th of an inch. While some densifiers penetrate well over 1/64th of an inch, if more than 1/64th of an inch of the surface is lost than it is no longer polished. Conversely, sodium silicate densifiers vary widely with regard to abrasion resistance. Most sodium silicate densifiers provide increased abrasion resistance of 40-80%. 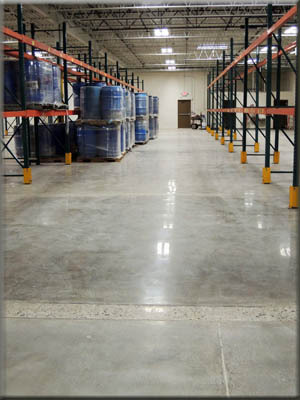 When considering a polished concrete floor, the 5-10% difference in the overall price of the floor is negligible when taking into account the increased abrasion resistance of the more expensive densifier, which translates into a substantial increase in longevity of the floor over alternative products. All polished concrete “sealers” are penetrating. 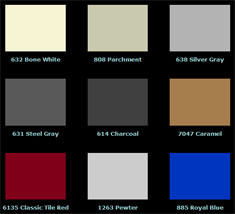 They penetrate the surface of the concrete and have no topical characteristics. No other type of surface forming sealer should be used in conjunction with concrete polishing. The shine from concrete polishing is achieved through a process similar to polishing granite or slate, which is why the shine can last decades or more. When a topical sealer is applied to achieve shine, the shine will only last as long as the sealer. And depending on traffic, that may be anywhere from 3 months to just a few years.